I finally got around to organising my recipe index the other night. Though it’s still a work in progress, I’m much happier now that the more than 150 (!!!!!) recipes are catalogued under various headings, from Starters to Veggie Mains. One thing that struck me whilst I was busy cutting and pasting links was the lack of dessert recipes on this site. There’s only three posts. Three out of a hundred and fifty. Wow. It makes sense though: I’m a savoury girl and when we have company I often just buy in choc ices or Fruit Pastilles ice lollies to round off the meal. Nowt wrong with that, I say, but I do feel that I should perhaps try my hand at a few more sweets and puddings. In particular, it’d be nice to have a few special desserts up my sleeve for ummmm… special occasions. So here’s my first offering – Strawberry Shortcake. It’s very simple but it’s beautiful and it tastes like a dream. 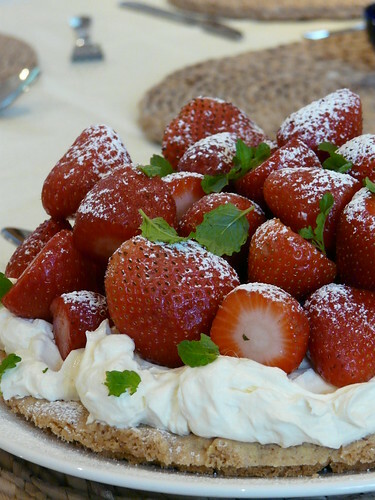 For the best results, whip the cream and add the strawberries and icing sugar just before serving. Thanks to Sophie for the cream/yogurt idea. It lightens up this dish perfectly. Add the butter, flour and sugar to a blender and whizz until the ingredients form a rough ball. Place mixture in a 22cm springform cake tin and press down to cover bottom. Prick with a fork and bake in a 180oC oven for 45 minutes until golden. Cool in tin. Whisk the double cream and honey until just whipped. Fold in the yogurt until just combined. Spoon the cream mixture onto the shortbread and pile the strawberries on top. I am exactly the same as I’m sure you’ve noticed! And I am trying the exact same thing – I blogged a mango sorbet recently! Your shortcake looks amazing – you should defintiely do more sweet stuffs. 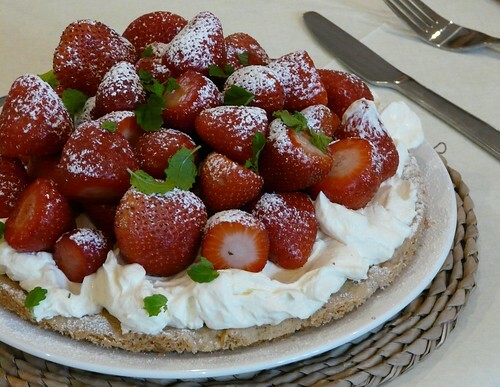 Have you made Sophie’s pavlova by the way? I have – it is amazing! This looks lovely – I saw the pictures in your Flickr account the other day and hoped you’d post it. Is the pretty garnish on the piccys mint leaves? Very happy to see my whipped cream with yogurt suggestion put to good use elsewhere. I much prefer it to plain whipped cream and it’s better for you too. Excellent way to redress the balance. But then, you know how I feel ’bout sweets, too. Love the recipe index – they take an AGE to set up, but going through your own archive is a treat within itself. Looks delicious – especially the idea of cream and yoghurt! And your index is looking great – I think cakes (esp warm out of the oven) make a great dessert but once you start on the categories there is both the frustration at foods which seem to fit a few categories and also the inspiration of seeing categories crying out for more items! I always lighten up cream as well, but with curd cheese – but yogurt sounds like a great alternative. And a beautiful summer dessert photo!! I’m fascinated by the idea of the yogurt folded into the cream. That looks perfect for this time of year. I’ll have to try it! Who doesn’t love a little shortcake??? FYI: My blog was suddenly removed from the net (not by me!) on Friday night and apparently no longer exists. The farmer’s market exchange is still on, but I just thought I’d let you know since you may wonder why my site doesn’t come up. Finger’s crossed, we can come to the bottom of it and recover the last year or my life…ahhhhh! I bet it tastes exactly like a dream…ahhh! Creamy goodness! Thanks for sharing. If you don’t I’d love to direct Foodista readers to your blog. Just add your choice of widget to this post and you’re all set! Yum. Shortbread and strawberries (Scottish?). Nuff said. Yum again. Wendy, I’ve been meaning to ask if you are ok if I add your link to my blog? Helen – Saw the mango sorbet. Looked luscious! Sophie – Cracking idea. Totally makes the dish, I think. Lucy – It was fun. And 150!!!! Who knew? Johanna – Very true. The blueberry or apple cake, I usually serve as a dessert. Pille – Thank you. I liked how the photo caught the freshness of the dessert. It was lovely. Desone007 – Thank you for the offer. Aforkfullofspaghetti – My neighbour makes THE most amazing shortbread. Must must must get the recipe from her for you all. Shona – Fixed! Let me know when you’re back over in Scotland, btw. Y – Shall try. Not a sweet-toothed person though. When I want to experiment it’s almost always with veg. Roo – Thank you and of course!